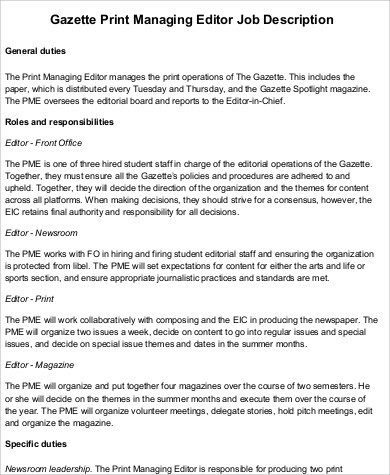 Managing editors are responsible for a myriad of aspects in any publication. 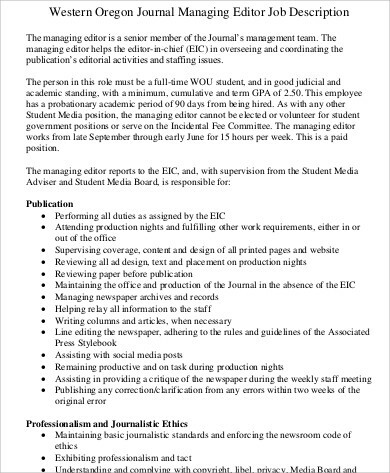 They are not merely tasked with editing, but they also plan, assign duties, coordinate with junior editors, follow the mandates of the executive editor, instruct, coach, and discipline junior/associate editors, and represent the publication/company in community events and social function in case the executive editor is unavailable. 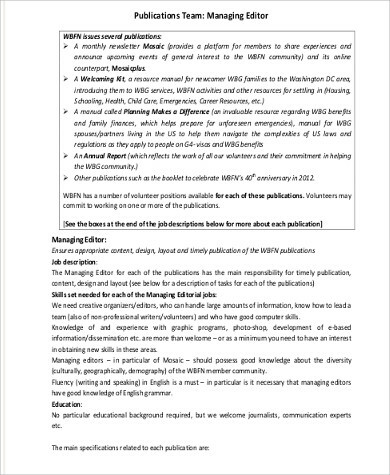 Indeed, this job position is abounding with crucial responsibilities, that is why if you are the manager, recruiter, or owner of a large-scale publication, then you need to ensure that your managing editor would be made aware of the specific parameters of his/her job position. 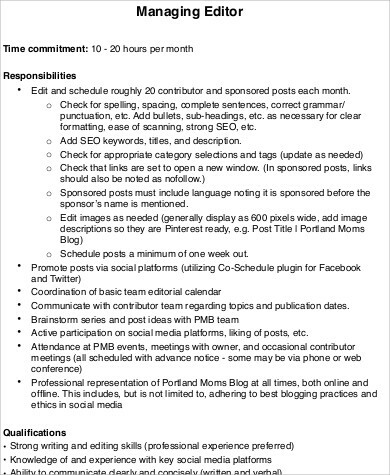 You can do this by referring to a job description, and for your convenience, we have a huge collection of managing editor Job Description Samples that are available for download. Scroll down below and click on the ones that you prefer. 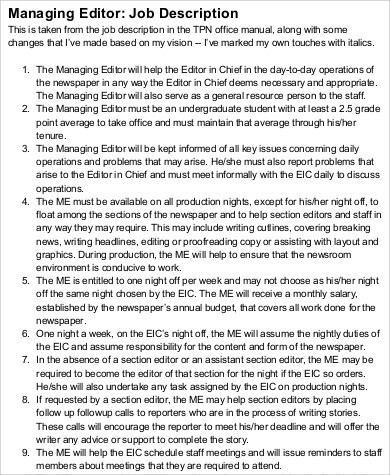 A managing editor must know how to perform the tasks of a basic copy editor, as well as other higher-level tasks that pertains to the management of one or more editing teams. 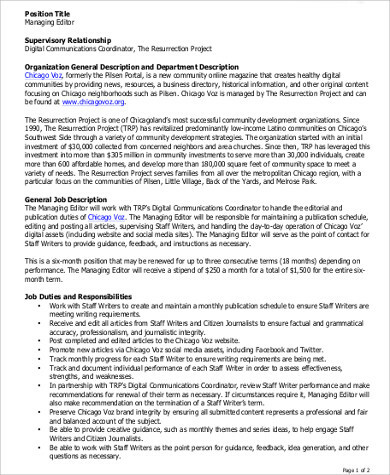 when an executive editor is preoccupied with meetings, an associate editor would serve as the representative of the publication during community events and fund-raising events. 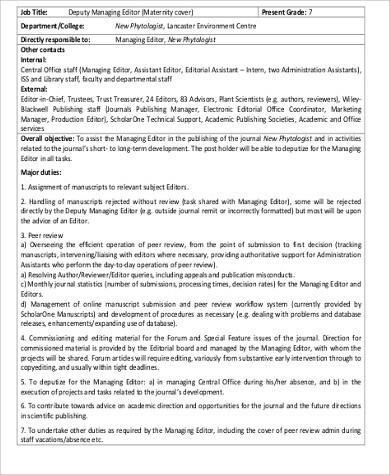 For a more comprehensive list of the managing editor’s job functions, download our well-crafted and informative templates on this page. Are you handling a magazine publication? 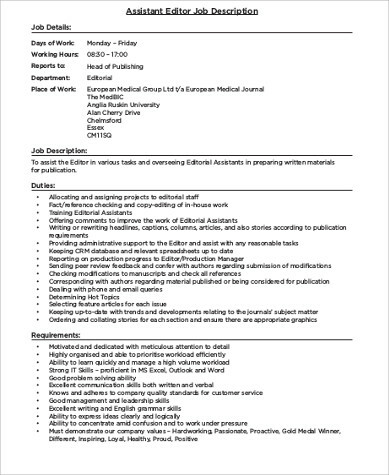 Here, we have a collection of Magazine Editor Job Description templates that you may download for free. Simply click on the link provided. improves the overall quality of the content/manuscript by removing inconsistencies and repetitions, and using the most appropriate words and terms. 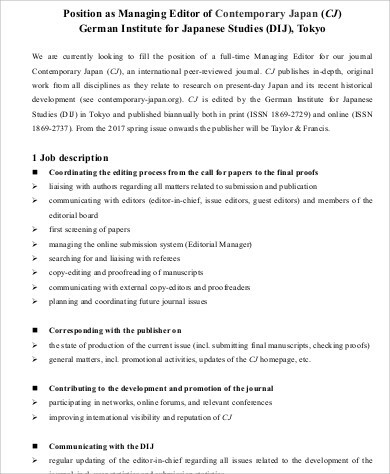 For more reference about the tasks of a basic editor, check out our collection of Copy Editor Job Description samples.